Ken Butler’s artwork is playful. Often, literally. 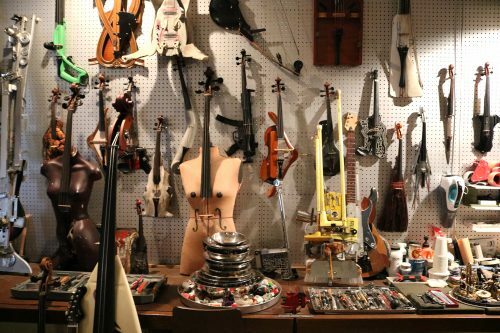 He designs, builds and plays unconventional musical instruments, crafting them out of everyday household objects or discarded junk on Brooklyn sidewalks. Through his eyes, an old printer cartridge plus a zip tie is a drum. A golf club is a guitar/sitar combo. His art is sculptural yet not purely sculpture; it’s captivating, conceptual and just pure fun. We were able to tour his studio, hang out and have a jam session with him this past Sunday, on a New York Adventure Club excursion. And you can do the same in a few weeks when he opens his doors again for Greenpoint Open Studios (on June 3rd and 4th, from 12-6pm each day). Formally trained in music as a child, and later getting turned on to art after smoking pot and listening to Jimi Hendrix, Ken started out as a young artist in the late 70s making collage art and prints using old x-rays. He describes the moment he discovered he could be a conceptual artist: he was making prints of x-rays and realized that the the spine resembled the neck of a guitar, and the rest of the body, the instrument. So he realized he wanted to combine his two true loves, music and art. And at the time no one was doing it—but he was determined. The x-ray/instrument/body idea planted a seed for his career as an artist. In the early 80s, Ken was living in a cheap old house in Portland with a few other young artist types. Down in the basement, he discovered an old, worn down axe; and it was pure kismet when he realized that the busted up axe fit perfectly—and precisely—into an old empty violin case he had laying around. So he decided to experiment and figure out whether he could actually transform the axe into a playable violin. After adding some screws, two strings, pegs and a small amplification device, the axe violin was primitive but totally playable. Somehow, the thing sang. It was even downright graceful. And the piece wasn’t just a wacky novelty item; it actually made a statement. About hard work, hand craftsmanship, and the fact that it was an axe was just too perfect—very literally it’s got chops. And while it could take months for a master violin-maker to create a perfect instrumen, he’d just taken a shortcut, creating one in a couple of hours out of an old piece of junk. The axe violin was the first of many unusual objects he turned into instruments, and it was the true start of Ken’s artistic and musical oeuvre. 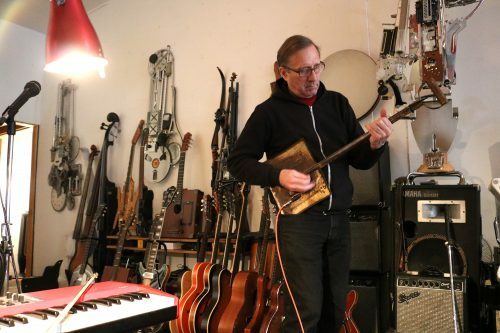 In his North Brooklyn studio there’s a vast array of handmade sonorous-meets-slapstick treasures, many of them playable. 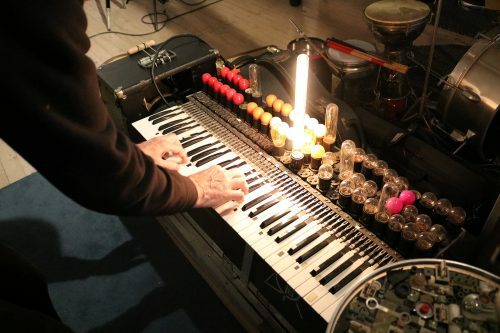 A 12-key “grand piano” that plays urban sound effects; a tennis racket guitar; a shovel guitar; a keyboard that turns lightbulbs on and off; the list goes on. There’s a lot to discover and Ken is full of stories. 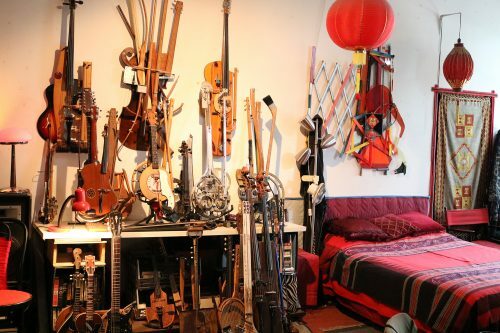 I would tell you more of them, but it’s better if you hear them from Ken himself—visiting his studio was a rare treat, and a window inside his playful and artistic brain and creative process. His studio should not be missed during this year’s Greenpoint Open Studios. New York Adventure Club sets up fun and unique experiences all over the city for small groups to enjoy; often they’re limited edition behind-the-scenes tours like the one we had with Ken. You can find out more about booking a hidden gem experience on their site. ← Casual Korean BBQ & Fried Chicken Hit Manhattan Ave.